Introduction The purpose of this study was to evaluate if ultrasound derived measures of diaphragm thickening, rather than diaphragm motion, can be used to predict extubation success or failure. Methods Sixty-three mechanically ventilated patients were prospectively recruited. Diaphragm thickness (tdi) was measured in the zone of apposition of the diaphragm to the rib cage using a 7–10 MHz ultrasound transducer. The percent change in tdi between end-expiration and end-inspiration (Δtdi%) was calculated during either spontaneous breathing (SB) or pressure support (PS) weaning trials. A successful extubation was defined as SB for >48 h following endotracheal tube removal. Results Of the 63 subjects studied, 27 patients were weaned with SB and 36 were weaned with PS. The combined sensitivity and specificity of Δtdi%≥30% for extubation success was 88% and 71%, respectively. The positive predictive value and negative predictive value were 91% and 63%, respectively. The area under the receiver operating characteristic curve was 0.79 for Δtdi%. Conclusions Ultrasound measures of diaphragm thickening in the zone of apposition may be useful to predict extubation success or failure during SB or PS trials. Can ultrasound measurements of diaphragm muscle thickening during inspiration provide a measure of extubation success or failure? We found that measurements of diaphragm thickening in the zone of apposition outperform standard measures of extubation outcome. Learn the rationale for using ultrasound measures of diaphragm muscle thickening to predict extubation outcomes, how these measures differ from ultrasound measures of diaphragm dome motion, and how this measure compares with other measures used to predict extubation success or failure. Direct measures of diaphragm function as predictors of extubation success or failure have not been extensively evaluated. Motion of the diaphragm dome has been assessed using M mode ultrasound14 ,15 and found to be useful in predicting extubation outcomes16 ,17; however, imaging the dome does not directly visualise the diaphragm muscle itself and factors such as breath size, impedance of neighbouring structures, abdominal compliance, rib cage or abdominal muscle activity, and ascites will affect regional and global diaphragm motion of the tendonous dome of the diaphragm.18 This drawback can be circumvented by ultrasonography of the diaphragm in the zone of apposition (ZAP) as this approach allows for direct visualisation of the diaphragm muscle and assessment of its activity.19–25 Diaphragm thickening during inspiration reflects diaphragm shortening and is analogous to an ‘ejection fraction’ of the heart. The purpose of this study was to assess whether the degree of diaphragm thickening as measured by B mode ultrasound during a weaning trial can be used to predict extubation outcomes. Sixty-three patients were prospectively recruited from medical intensive care units at Memorial Hospital of Rhode Island and Rhode Island Hospital. The study was approved by the institutional review boards at both the institutions (IRB #09-45 for Memorial Hospital of Rhode Island and CMTT #0095-10 for Rhode Island Hospital) and informed consent was obtained for all study participants. All patients were clinically stable and identified by the intensivist as ready to undergo a low-level PS weaning trial or a SB trial. Subjects were recruited 6–24 h prior to the first weaning trial. The ultrasonographer was notified of the intensivist's decision to start weaning and obtained informed consent. No specific disease process was required for entry into the study other than the presence of respiratory failure. All subjects had a fraction of inspired oxygen (FIO2) of <50%, were haemodynamically stable in the absence of vasopressors, and alert. Exclusion criteria included pregnant women, age <18 years and surgical dressings over the right lower rib cage which would preclude ultrasound exam. Subject characteristics are given in table 1 and the causes of respiratory failure are summarised in figure 1. Aetiology of respiratory failure in the subject population. Diaphragm thickness (tdi) was measured using a 7–10 MHz linear ultrasound probe set to B mode (LOGIQ Book, GE Healthcare, Waukesha, Wisconsin, USA). The right hemidiaphragm was imaged at the zone of apposition of the diaphragm and rib cage in the midaxillary line between the 8th and 10th intercostal spaces as previously described.19 All patients were studied with the head of bed elevated between 20° and 40°. The tdi was measured at end-expiration and end-inspiration. A flow-meter (Hamilton FlowSensor H) was placed in the ventilator circuit and flow recorded simultaneously with ultrasound images to confirm end-expiration and end-inspiration on the ultrasound images. The per cent change in tdi between end-expiration and end-inspiration (Δtdi%) was calculated as (tdi end-inspiration−tdi end-expiration/tdi end-expiration)×100. The Δtdi% for each patient represented the mean of three to five breaths. Images were obtained within the first 5 min of the SB or the PS trial. Training the ultrasound operator to identify the diaphragm and measure its thickness took three to five sessions lasting 10–15 min each. Intraobserver variability in measuring Δtdi% was <10%. Weaning trials consisted of SB trials (t-piece with zero PS) or PS trials (reducing PS by 5 cm H2O until a PS level of Δ5/5 was obtained). The different types of weaning trials (SB vs PS) reflected different practice patterns among the intensivists caring for the patients. The treating team was blinded to the ultrasound results, and the research team did not have a role in deciding whether or not a patient was extubated. A successful extubation was defined as SB for >48 h following extubation. A failed extubation was defined as someone who was reintubated within 48 h, terminally extubated, or requiring tracheostomy. Most patients were extubated within 6–12 h of measuring tdi (48/63) and nine had measurements within 12–36 h of extubation. Of the remaining six, three were terminally extubated and three required tracheostomy. The RSBI (f in breaths/minute (f)/tidal volume in litres (VT)) was calculated simultaneously with ultrasound measurements of tdi only during SBT. Measures of tdi at end-expiration have been shown to reflect diaphragm strength in healthy individuals.23 Since a sufficiently strong diaphragm would promote successful extubation, we evaluated whether tdi end-expiration would be useful for determining extubation success or failure. Since the diaphragm shortening contributes to tidal volume, we combined Δtdi% with measures of breathing pattern (VT and f) and evaluated whether these parameters could predict extubation success or failure. Descriptive statistics are presented as the mean±SD for continuous variables. χ2 tests were used to assess differences in groups for the categorical variables. Sensitivity, specificity, positive predictive value (PPV) and negative predictive value (NPV) were calculated for ultrasound derived measurements of tdi in the PS and SB trial groups and for RSBI in the SB trial group in predicting extubation success. The cut-off points for each index are given in table 2. 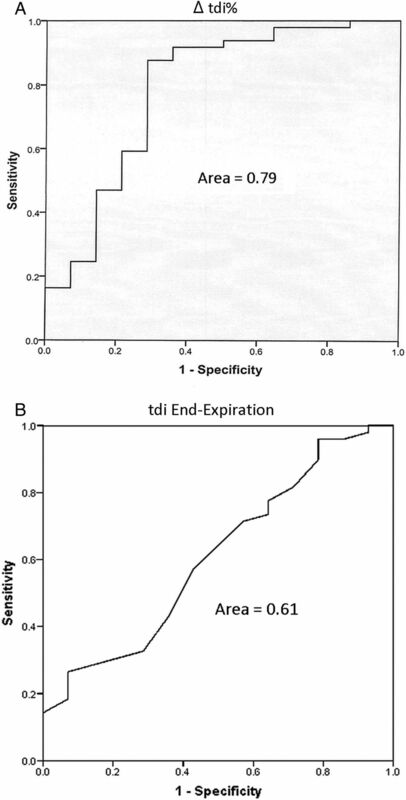 Receiver operating characteristic (ROC) curves were used to evaluate the efficacy of ultrasound derived measurements of Δtdi%, tdi end-expiration, Δtdi%×VT, Δtdi%/f and RSBI in predicting extubation success or failure. Median and IQR were calculated for ventilator days for the PS and SB trial groups. A Wilcoxon test was used to compare ventilator days between the PS and the SB trial groups. A p value <0.05 was considered statistically significant. Data analyses were performed using SAS V.9.2 (SAS Institute, Cary, North Carolina, USA). Sixty-three patients were studied. Thirty-six patients (17 men, 19 women; average age 66.0±19 (SD) years had measurement of Δtdi% at a PS of Δ5/5 and 27 patients (14 men, 13 women; average age 69.6±17 years) had measurements of Δtdi% during a SB trial. There was no difference in ventilator days between the PS and SB trial groups. (p=0.97). The 36 patients weaned to a PS of Δ5/5 had a median of 5.00 days of ventilator support with an IQR of 4.00. The patients weaned with a SB trial received a median of 5.00 days of ventilator support with an IQR of 8.50 days. The Δtdi% and tdi end-expiration values for all subjects are shown in figures 2A,B respectively. Of the 49 patients who were successfully extubated, 43 had a Δtdi% of ≥30%. Of the 14 who failed extubation, 10 had a Δtdi% < 30%. The resulting sensitivity and specificity was 88% and 71%, respectively. The PPV of a Δtdi% ≥ 30% for extubation success was 91% and the NPV of a Δtdi < 30% for extubation failure was 63% (table 1). The area under the ROC curve for Δtdi% was 0.79 (figure 3A) and for tdi end-expiration it was 0.61 (figure 3B). Values for (A) Δtdi%, (B) tdi end-expiration are depicted for all subjects who were successfully extubated or failed extubation. The dashed line represents the cut-off value for Δtdi% (≥30%) and tdi end-expiration (≥ 0.17 cm). Receiver operating characteristic (ROC) curves for (A) Δtdi%, (B) tdi end-expiration. The area under the curve is expressed as a ratio of the total area. Four patients failed extubation despite having a Δtdi% ≥ 30%. However, factors unrelated to diaphragm contractility such as the development of congestive heart failure (CHF), fever and acute change in mental status, mucous plugging, and aspiration, precipitated respiratory failure and the need for reintubation in these individuals. These non-mechanical factors lowered the NPV and specificity of Δtdi%. The remaining 10 patients who failed extubation had a Δtdi% < 30%. In these individuals extubation failure was attributed to ‘respiratory pump’ failure in eight. One patient failed because of fluid overload and fever and one because of a new cerebrovascular accident (CVA) and aspiration. When comparing the subgroups of those weaned using PS and those weaned with a SB trial, Δtdi% predicted extubation success or failure equally well. Of the 25 patients who were successfully extubated at a PS of Δ5/5, 24 had a Δtdi% ≥ 30%. Of the 11 patients who failed extubation, 7 had a Δtdi% < 30%. The resulting sensitivity, specificity, PPV and NPV are listed in table 2. Of the 24 patients successfully extubated after a SBT, 18 had a Δtdi% ≥ 30%. Of the three patients who failed extubation, all had a Δtdi% < 30%. The resulting sensitivity, specificity, PPV and NPV are listed in table 2. The RSBI was calculated for 27 patients who underwent a SBT. The sensitivity, specificity, PPV and NPV for a RSBI ≥ 105 are given in table 2. We evaluated if measures of tdi at end-expiration or if composite measures of Δtdi% and breathing pattern would be better predictors of successful extubation than Δtdi% alone (table 1). None of these parameters (tdi at end-expiration, Δtdi%×VT and Δtdi%/f) enhanced the predictive value of Δtdi% alone. Ultrasound is a technology that is increasingly used by intensive care physicians to assist in central line placement and other procedures.26 Recently, ultrasound has been used to assess the presence of diaphragm dysfunction postoperatively,27 to identify the occurrence of ventilator induced diaphragm injury3 and to evaluate diaphragm dome motion during SB weaning trials.16 However, the extent to which the diaphragm dome moves during inspiration can be affected by breath size, impedance of neighbouring structures and abdominal compliance. These confounders can be circumvented by visualising the diaphragm muscle itself in the zone of apposition. The present study indicates B mode ultrasound can be used to predict extubation outcomes during PS and SB weaning trials. B mode ultrasound measurements of tdi have been correlated with diaphragm strength and muscle shortening.19 ,20 ,23 The volume of diaphragm muscle mass is constant as it contracts. Therefore as it shortens, it thickens and measures of Δtdi are inversely related to changes in diaphragm length (ldi) (Δtdi ≈ 1/Δldi). In support of this notion, calculation of Δldi from measures of Δtdi in healthy individuals are in the range of what has been measured in humans and the absence of diaphragm thickening has been noted in patients with diaphragm paralysis.20 ,28 Since the diaphragm is the major muscle of inspiration, the presence of diaphragm contraction and shortening should be a prerequisite for successful extubation. The high PPV of Δtdi% ≥ 30% and our finding that 10 of 14 patients who failed extubation had a Δtdi%<30% is consistent with this concept. We found that diaphragm contraction, as assessed by Δtdi% performed better than simultaneous measures of RSBI during SBT. The superiority of Δtdi% to RSBI during SBT may be attributed to the importance of the diaphragm's contribution to VT. The RSBI is an integrative function of respiratory load and inspiratory muscle capacity. It reflects the function of all inspiratory muscles including the diaphragm, scalenes, parasternal intercostals and accessory inspiratory muscles (sternomastoids and external intercostals). If the diaphragm is failing, the non-diaphragm inspiratory muscles will compensate to preserve VT and the presence of diaphragm weakness may be ‘masked’ by the increased contribution of the non-diaphragm inspiratory muscles (‘rib cage’ muscles) to VT. However, the rib cage muscles are more fatigable and weaker than the diaphragm, and these muscles will not be able to sustain adequate ventilation.29 ,30 Accordingly, extubation failure may occur despite an initially acceptable VT and RSBI. In this condition, direct measures of diaphragm function using B mode would better predict extubation failure as was the case in 10 of 14 patients who the intensivist judged as ready for extubation using conventional weaning criteria but had a Δtdi% < 30% and required reintubation. We evaluated tdi at end-expiration and combined measures of Δtdi% with components of breathing pattern (VT and f). We found that the ROC for tdi end-expiration was less than that for Δtdi% alone (0.79 for Δtdi% and 0.61 for tdi end-expiration). The failure of this model to improve extubation predictions may be related to the variability of tdi among individuals24 ,25 or the presence of ventilator induced diaphragm atrophy in some but not other patients.3 We reasoned that the product of Δtdi% and VT may be a better predictor of extubation success than Δtdi% alone. Diaphragm shortening contributes to the majority of volume change during inspiration. For a given degree of diaphragm shortening, an ‘efficient’ diaphragm will yield a greater tidal volume and lower breathing frequency than a diaphragm contracting at a mechanical disadvantage. However, we found that incorporating either VT or f with Δtdi% did not improve extubation predictions. One limitation of our study is that measures of Δtdi% were not performed immediately before extubation. It is possible that some patients with a Δtdi%<30% 12–36 h prior to extubation and were successfully extubated may have had a Δtdi% ≥ 30% immediately prior to extubation. The converse is also true. A prospective study designed with measures of Δtdi% immediately prior to extubation is needed to address the above limitation. Another possible limitation would be variability of end-expiratory lung volume. Although absolute values of end-expiratory lung volume were not measured, we used a flow-meter to identify end-expiration and end-inspiration and it is unlikely that functional residual capacity (FRC) changed significantly during the brief period when Δtdi% was measured. Finally, our study also only evaluated Δtdi% for the right hemidiaphragm. We chose to only evaluate the right hemidiaphragm because the acoustic window provided by the liver makes it easier to make the measurement in the right ZAP and we wanted to evaluate a weaning index that would be practical and easy for intensivists to implement. We conclude that ultrasound measures of diaphragm muscle thickening may predict extubation success or failure with PS and SB weaning trials and that this method may be especially helpful in reducing the number of failed extubations. This measure of diaphragm function can be performed at the bedside, requires no special effort by the patient, and can be used during either PS or SB trials. The ubiquitous presence of ultrasound equipment in intensive care units indicates that there need not be additional capital equipment expenditures. The portability and availability of ultrasound make measures of tdi ideally suited for incorporation into the intensivist's decision-making process to complement the complete assessment of the patient in evaluating extubation outcome.
. Incidence and outcome of weaning from mechanical ventilation according to new categories. Eur Respir J 2010;35:88–94.
. Diaphragm muscle thinning in patients who are mechanically ventilated. Chest 2012;142:1455–60.
. Both high level pressure support ventilation and controlled mechanical ventilation induce diaphragm dysfunction and atrophy. Crit Care Med 2012;40:1254–60.
. Ventilator-induced diaphragm dysfunction: the clinical relevance of animal models. 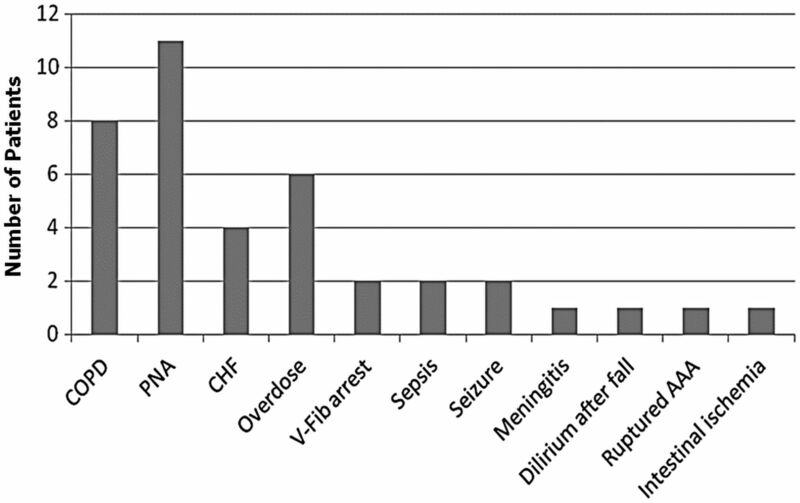 Intensive Care Med 2008;34:7–16.
. Rapid disuse atrophy of diaphragm fibers in mechanically ventilated humans. N Engl J Med 2008;358:1327–35.
. The prognostic significance of passing a daily screen of weaning parameters. Intensive Care Med 1999;25:581–7.
. Tidal volume maintenance during weaning with pressure support. Am J Respir Crit Care Med 1995;152:1034–40.
. Evaluation of conventional criteria for predicting successful weaning from mechanical ventilatory support in elderly patients. Critical Care Med 1989;17:858–61.
. Evaluation of maximal inspiratory pressure, tracheal airway occlusion pressure, and its ratio in the weaning outcome. J Crit Care 2009;24:441–6.
. A prospective, blinded evaluation of indexes proposed to predict weaning from mechanical ventilation. Intensive Care Med 2004;30:830–6.
. A prospective study of indexes predicting the outcome of trials of weaning from mechanical ventilation. N Engl J Med 1991;324:1445–50.
. Rapid shallow breathing (frequency-tidal volume ratio) did not predict extubation outcome. Chest 1994;105:540–3.
. Technical report: quantitative assessment of diaphragmatic movement–a reproducible method using ultrasound. Clin Radiol 1992;46:405–7.
. Ultrasonographic evaluation of diaphragmatic motion. J Ultrasound Med 2001;20:597–604.
. Ultrasonographic evaluation of liver/spleen movements and extubation outcome. Chest 2004;126:179–85.
. Diaphragm dysfunction assessed by ultrasonography: influence on weaning from mechanical ventilation. Critical Care Med 2011;39:2627–30.
. Subphrenic abscess. Am J Roentgenol Radium Ther Nucl Med 1967;101:961–9.
. Diaphragm thickening during inspiration. J Appl Physiol 1997;83:291–6.
. Ultrasound evaluation of the paralyzed diaphragm. Am J Respir Crit Care Med 1997;155:1570–4.
. Monitoring recovery from diaphragm paralysis with ultrasound. Chest 2008;133:737–43.
. Dysfunction of the diaphragm. N Engl J Med 2012;366:932–42.
. Maximal inspiratory pressures and dimensions of the diaphragm. Am J Respir Crit Care Med 1997;155:1329–34.
. Variability of diaphragm structure among healthy individuals. Am J Respir Crit Care Med 1997;155:1323–8.
. Diaphragm dimensions of the healthy preterm infant. Pediatrics 2001;108:E91.
. Sonographic evaluation of the diaphragm in critically ill patients. Technique and clinical applications. Intensive Care Med 2013;39:801–10.
. An evaluation of diaphragmatic movement by M-mode sonography as a predictor of pulmonary dysfunction after upper abdominal surgery. Anesth Analg 2010;110:1349–54.
. Contractility of the in situ diaphragm: assessment based on dimensional analysis. Respiratory Muscles and their Neuromotor Control: Proceedings of an Iups Satellite Symposium Held in Los Angeles, California, July 22–24, 1986. New York: Liss, 1987.
. Preferential fatigue of the rib cage muscles during inspiratory resistive loaded ventilation. J Appl Physiol 1989;66:750–4.
. Relative strengths of the chest wall muscles. J Appl Physiol 1988;65:852–62. Contributors FDM is the guarantor of the content of the manuscript, including the data and analysis. ED has made substantial contributions to acquisition of data, data analysis, data interpretation and drafting the manuscript EJG has made substantial contributions to design, data interpretation, and provided critical revisions for important intellectual content. JMS has made substantial contributions to design, data interpretation, and provided critical revisions for important intellectual content. Ethics approval Memorial Hospital of Rhode Island IRB and Rhode Island Hospital IRB.